Conditions By visiting and/or using our website you are agreeing to the following terms and conditions. Please read the terms and conditions below and if you do not agree with them, we ask that you refrain from visiting and or using the website. Because of the possible unanticipated changes in governing statutes and case law relating to the application of the information contained on this website. The authors and creators and any and all persons or entities involved in any way in preparation of the website disclaim all responsibility for the legal effects or consequences of the interpretation of the information provided. Individuals intending to use Quick divorce Clerks as an information resource should seek advice from family law professionals and experts. This website was not created and made available with the intention that it be used to procure Legal advice in any jurisdiction. Quick divorce Clerks produces search links to sites located throughout the worldwide web and Internet. Quick Divorce Clerks makes no guarantees as to such sites and information including as to the accuracy, currency, content, or quality. Quick divorce Clerks is not responsible for the content of any pages of advertisements, or any infringement of any trademark, copyright or other rights of any party contained in the pages or advertisements submitted to Quick divorce Clerks, or any violation of any applicable laws, orders, rulings or regulations arising anywhere in the world from where the advertisements or pages can be accessed. 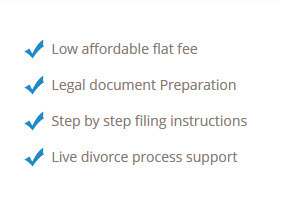 Quick divorce Clerks provides legal document preparation in certain states. We do not sell court forms. We are not Attorneys and cannot give you legal advice, you represent yourself in court. There is no guaranties in any legal case Judge from your local Court will determine your case. You understand that all information, data, text, software, messages or other materials (“Content”), whether publicly posted or privately transmitted, are the sole responsibility of the person from which such Content originated. This means that you, and not Quick divorce Clerks, are entirely responsible for all Content that you upload, post, email or otherwise transmit via the Service. Quick Divorce Clerks does not control the Content posted via the Service and, as such, does not guarantee the accuracy, integrity or quality of such Content. You understand that by using the Service, you may be exposed to Content that is offensive, indecent or objectionable. Under no circumstances will Quick Divorce Clerks be liable in any way for any Content, including, but not limited to, for any errors or omissions in any Content, or for any loss or damage of any kind incurred as a result of the use of any Content posted, emailed or otherwise transmitted via the Service. g. upload, post, email or otherwise transmit any unsolicited or unauthorized advertising, promotional materials, “junk mail,” “spam,” “chain letters,” “pyramid schemes,” or any other form of solicitation. You acknowledge that Quick Divorce Clerks does not pre-screen Content, but that Quick Divorce Clerks and its designees shall have the right (but not the obligation) in their sole discretion to refuse or move any Content that is available via the Service. Without limiting the foregoing, Quick Divorce Clerks and its designees shall have the right to remove any Content that violates any rights or is otherwise objectionable. You agree that you must evaluate, and bear all risks associated with, the use of any Content, including any reliance on the accuracy, completeness, or usefulness of such Content. In this regard, you acknowledge that you may not rely on any Content created by Quick Divorce Clerks or submitted to Quick Divorce Clerks, including without limitation information in Quick Divorce Clerks, Calendar and in all other parts of the Service. You acknowledge and agree that Quick Divorce Clerks may preserve Content and may also disclose Content if required to do so by law or in the good faith belief that such preservation or disclosure is reasonably necessary to: (a) comply with legal process; (b) (c) respond to claims that any Content violates the rights of third-parties; or (d) protect the rights, property, or personal safety of Quick Divorce Clerks, its users and the public. D. INDEMNITY You agree to indemnify and hold Quick Divorce Clerks, and its subsidiaries, affiliates, officers, agents, co-branders or other partners, and employees, harmless from any claim or demand, including reasonable attorneys’ fees, made by any third party due to or arising out of Content you submit, post to or transmit through the Service, your use of the Service, your connection to the Service, or your violation of any rights of another. E. GENERAL PRACTICES REGARDING USE AND STORAGE You acknowledge that Quick Divorce Clerks may establish general practices and limits concerning use of the Service, including without limitation the maximum number of days that message center postings or forum postings or other uploaded Content will be retained by the Service. F. MODIFICATIONS TO SERVICE Quick Divorce Clerks reserves the right at any time and from time to time to modify or discontinue, temporarily or permanently, the Service (or any part thereof) with or without notice. You agree that shall not be liable to you or to any third party for any modification, suspension or discontinuance of the Service. G. DEALINGS WITH ADVERTISERS Your correspondence or business dealings with, or participation in promotions of, advertisers found on or through the Service, including payment and delivery of related goods or services, and any other terms, conditions, warranties or representations associated with such dealings, are solely between you and such advertiser. You agree that Quick Divorce Clerks shall not be responsible or liable for any loss or damage of any sort incurred as the result of any such dealings or as the result of the presence of such advertisers on the Service. H. LINKS The Service may provide, or third parties may provide, links to other World Wide Web sites or resources. Because Quick Divorce Clerks has no control over such sites and resources, you acknowledge and agree that Quick Divorce Clerks is not responsible for the availability of such external sites or resources, and does not endorse and is not responsible or liable for any Content, advertising, products, or other materials on or available from such sites or resources. You further acknowledge and agree that Quick Divorce Clerks shall not be responsible or liable, directly or indirectly, for any damage or loss caused or alleged to be caused by or in connection with use of or reliance on any such Content, goods or services available on or through any such site or resource. a. YOUR USE OF THE SERVICE IS AT YOUR SOLE RISK. THE SERVICE IS PROVIDED ON AN “AS IS” AND “AS AVAILABLE” BASIS. QUICK DIVORCE CLERKS EXPRESSLY DISCLAIMS ALL WARRANTIES OF ANY KIND, WHETHER EXPRESS OR IMPLIED, INCLUDING, BUT NOT LIMITED TO THE IMPLIED WARRANTIES OF MERCHANTABILITY, FITNESS FOR A PARTICULAR PURPOSE AND NON-INFRINGEMENT. b. QUICK DIVORCE CLERKS MAKES NO WARRANTY THAT (i) THE SERVICE WILL MEET YOUR REQUIREMENTS, (ii) THE SERVICE WILL BE UNINTERRUPTED, TIMELY, SECURE, OR ERROR-FREE, (iii) THE RESULTS THAT MAY BE OBTAINED FROM THE USE OF THE SERVICE WILL BE ACCURATE OR RELIABLE, (iv) THE QUALITY OF ANY PRODUCTS, SERVICES, INFORMATION, OR OTHER MATERIAL PURCHASED OR OBTAINED BY YOU THROUGH THE SERVICEWILL MEET YOUR EXPECTATIONS, AND (V) ANY ERRORS IN THE SOFTWARE WILL BE CORRECTED. d. NO ADVICE OR INFORMATION, WHETHER ORAL OR WRITTEN, OBTAINED BY YOU FROM QUICK DIVORCE CLERKS OR THROUGH OR FROM THE SERVICE SHALL CREATE ANY WARRANTY NOT EXPRESSLY STATED IN THE TOS.